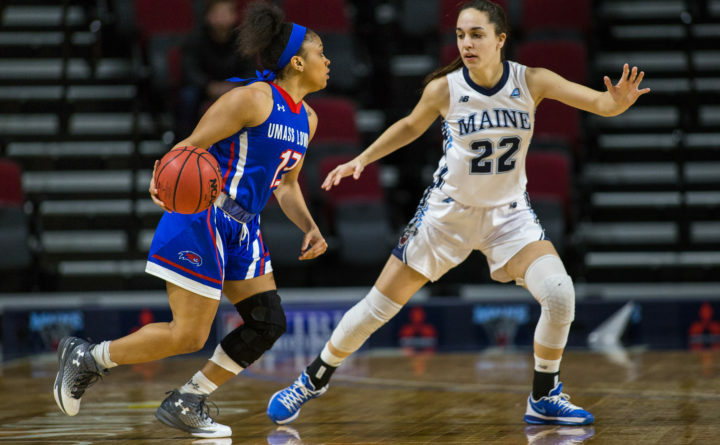 University of Maine's Blanca Millan (right) defends against University of Massachusetts Lowell's Markayla Sherman during their basketball game at the Cross Insurance Center in Bangor last season. University of Maine's Blanca Millan (right) tires for two past Northeastern's Gabby Giacone during a basketball game last year at the Cross Insurance Center in Bangor. ORONO, Maine — Blanca Millan made an immediate impact as a 5-foot-11 freshman guard on the University of Maine’s women’s basketball team last season. She averaged 8.6 points, 2.9 rebounds, 1.8 steals and 1.7 assists and was named to the America East All-Rookie team. She is making even more of an impact this season as a 6-foot-1 guard. The 19-year-old Millan grew 2 inches over the summer while playing for the Spanish national team in a variety of tournaments including the FIBA Under-19 World Cup in Italy. 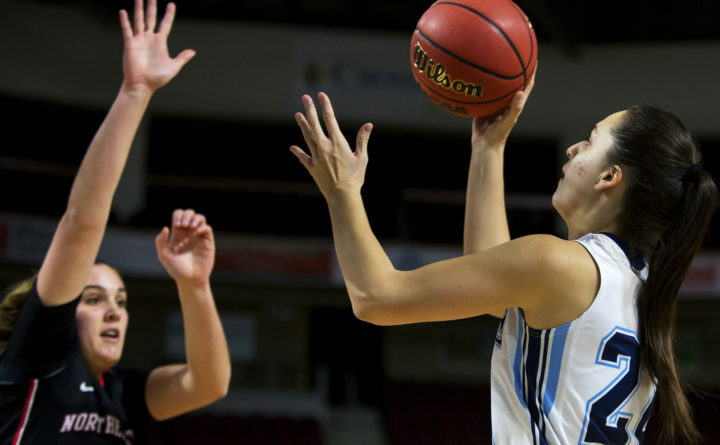 “That doesn’t happen often,” said UMaine interim head coach Amy Vachon. “She probably did a lot of stretching,” quipped junior Tanesha Sutton. “There must be something in the Spanish water,” added senior Kirsten Johnson. Millan, whose parents — both former professional players — are tall and whose sister is even taller than she, said the extra 2 inches have been advantageous. “It think it has been good for me because I was already a tall guard and now I’m even taller. If I need to go down into the post at some point, it’s really helping me because I’m getting stronger, too,” said Millan. The native of Santiago de Compostela, Spain, has been getting it done at both ends of the court for the 6-4 Black Bears, who play Sunday at fifth-ranked Mississippi State (10-0). Millan leads the team in scoring at 17.3 points per game and in steals (3.1) and 3-point percentage (44 percent) among players with at least 10 attempts. She ranks fourth in America East in scoring and in field goal percentage (51.4 percent) and averages 4.5 rebounds and 2.0 assists. Her 31 steals top America East. Millan, who led the team in steals a year ago (61 in 34 games), has made at least three steals in seven games including six in an 80-70 loss at Miami. She also leads the team in blocked shots (7). Millan, who has very active hands, is always assigned to cover the opposing team’s best guard when the Black Bears are playing man-to-man defense. “I thought she was the best defensive guard in the league last year,” said Vachon. “She is very gifted at reading passes and timing when the dribbler is going to cross in front of her. “She’s also versatile. She can play at the top or the bottom of our zone and that helps,” added Vachon. On offense, one of the reasons she has nearly doubled her scoring average is she has become a better shooter (51.4 percent), up from last year’s 43.5 percent. Her 3-point percentage (44) is much better than last year (.308). “It is very rare when your best defensive player is also one of your best offensive players. She has become much more consistent this year offensively,” said Vachon. “I’ve worked on my shot and my dribbling,” said Millan, who set a school record by shooting 92.3 percent (12-for-13) from the field in a 76-51 victory over Harvard and scored a career-high 28 points. She said playing for Spain at the World Championships was important to her development. “You get to play really good teams like the USA. Playing with real good players and against real good players, players who are taller and stronger than you are, makes you better,” said Millan. Millan knew she would have to be more assertive offensively this season after the graduation of three-time America East first-team guard Sigi Koizar (14.1 ppg last winter). “Even though I’m a sophomore, I knew I had to step up big for us along with Tanesha and Julie (Brosseau),” said Millan, who has only 12 turnovers in 10 games. Brosseau (13.4 ppg) and Sutton (11.4 ppgf) are the team’s Nos. 2 and 3 scorers, respectively. When Millan arrived on campus in 2016, she was accompanied by two other Spanish players, Laia Sole and Naira Caceres. Sole was the team’s No. 2 scorer (9.4 ppg) and was an All-Rookie choice and also earned the America East Sixth Player Award. But Sole and Caceres transferred to Duquesne and Butler, respectively. Three others also transferred. Even though she was close with Sole and Caceres, their departures definitely hasn’t had a negative impact on Millan. “I wasn’t surprised. I knew what was going on,” said Millan. “I miss them. They were like my sisters. I could speak Spanish with them every day. “But it wasn’t hard for me because I was close with all of my teammates. I want what is best for them and if (transferring) was what was best for them, I’m good with that,” said Millan. Millan said she has been happy with her season to date and has been surprised by her success because UMaine’s opponents “know me now and are going to scout me. “I knew it was going to be hard this season. But I work hard every day and my teammates and my coaches make me better. We have some really good players and, because of them, it makes things easier for me,” said Millan.